In our post back in May, we looked at the Sri Lankan mobile market. Dialog Axiata is the mobile operator with largest market share. In its 2017 annual report, it mentions that there are 3,000 2G/3G sites and over 1,500 4G sites. The 4G LTE coverage has a lot of scope for improvement. It has also launched 4.5G, LTE-Advanced Pro features that allow download speeds in excess of 1 Gigabits per Second (Gbps). In addition, as per the report, "Dialog Broadband Networks (DBN) serves over 700,000 individuals and corporates, providing multiple services including fixed telephony, hosted PABX offerings, broadband, internet leased lines, data communication, Internet Data Centre (IDC), converged ICT solutions, telecommunication infrastructure, transmission and backbone services. DBN commercially launched 4.5G technology in June 2017, establishing yet another milestone in the region’s broadband technology landscape featuring download speeds in excess of 100 Mbps. The fixed LTE demonstrated accelerated growth, where the customer base grew by 59% in 2017, surpassing 300,000 subscribers. DBN launched Prepaid LTE in July 2017, the only Prepaid option for Home Broadband (HBB) to cater to the mass market. Additionally, VoLTE services were launched on HBB routers by end of 2017, providing crystal clear voice solutions." 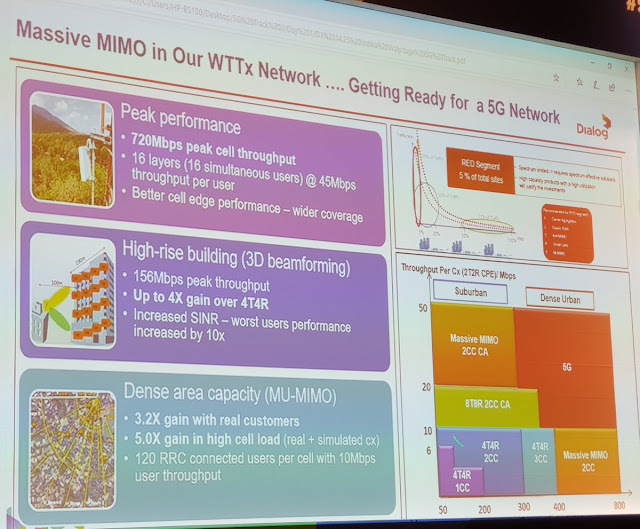 Indika Walpitage, Vice President, Network Operations & Service Assurance, Dialog Axiata shared his perspective on technical requirements on path to 5G at 5G Asia yesterday. The following are couple of pictures/slides shared by Neil Shah from Counterpoint Research on Twitter. As mentioned above, they have already launched 4.5G which includes Massive MIMO as well. Acquisition of larger spectrum blocks such as 100 MHz will be a challenge in Sri Lanka in the 3.5GHz band as there are occupants already using legacy wireless technologies like Wimax and other proprietary solutions. Regulations related to the use of E band and other high bands are not yet finalised in Sri Lanka. This will cause some delays in introducing commercial 5G networks locally. Since 2G, 3G and 4G are still widely used, having to co-locate a fourth technology on existing base station infrastructure will be a challenge. There will be challenges in installing heavier antenna integrated radios into existing infrastructure. Operators need to densify the network, especially when we deploy 5G at higher frequencies. This needs a sound business case to justify the investments and is going to be a logistically challenging task. Deployment of fibre to all sites is essential to support the higher fronthaul and backhaul bandwidths which are needed in 5G systems. This also creates a significant challenge for operators like us. We have been actively lobbying with the regulator to release the spectrum required to rollout 5G. In terms of infrastructure readiness we have been working proactively since the introduction of SDR based radio products by major network equipment suppliers. 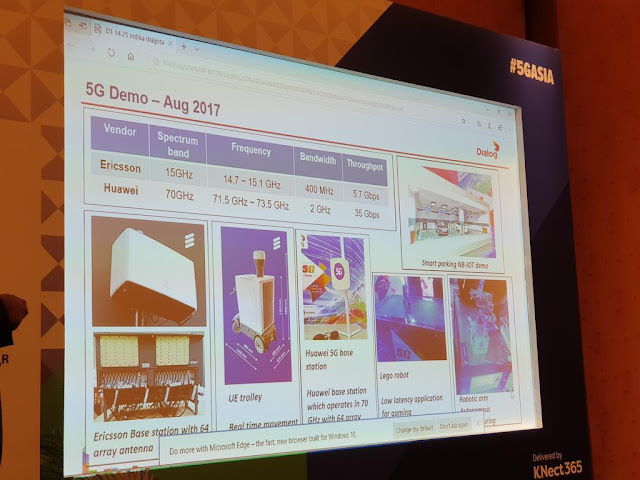 All new procurements are in line with 5G architecture to support upgrading to 5G. The core and transport network roadmap is being developed with 5G and its applications in mind and we are already progressing towards building cloud-based NFV and SDN infra. We have already deployed a considerable number of massive MIMO radios in the access network. More importantly, building people skills on digitization and automation within the organization is key to success in our 5G journey. We have focused attention on this aspect. We have realized the importance of introducing commercial 5G networks to our market as soon as the technology is ready. Currently the use case is enhanced broadband with low cost per bit, yet in the future we will see multiple use cases, mainly targeting industry automation. It’s important to work with business and technology partners to identify the needs and correct solutions while working with regulators to secure the spectrum assets. We also need to integrate with the complete 5G ecosystem to get maximum gains. Digitization and automation should be key ingredients in the 5G success formula.